I have been playing Magic on and off since about 2005. My background is 60 card however these days I mainly play Commander (EDH). My preferred play style is combo, usually with a decent control suite. I have been playing Commander since 2012 and play both casually and competitively. I mainly play combo oriented decks which are fast and controlling. 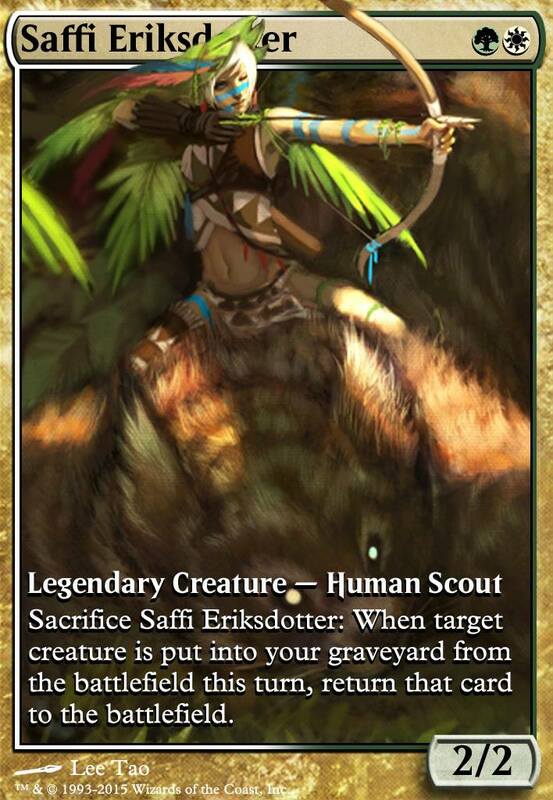 My two competitive decks are my Damia, Sage of Stone deck, Damia Morgendorffer and my Saffi Eriksdotter deck, Just Stay Dead (complete with primer). I have a bunch of casual decks too and they can be found here. I only really play 60 card formats casually (i.e. within my playgroup), however I am looking to get more into Modern. That being said, from time to time I'll have an idea pop up for a Legacy/Vintage deck. My Modern decks can be found here. I'm always happy to give deck advice. Let me know what you're wanting to do and I'll see what I can suggest to help. The best place for posting broken cards is the official broken/missing card/token thread, however I think there has been a bit of a legality bug issue recently, I have seen YeaGO (the site admin) posting on similar threads. April 10, 2019 6:03 a.m. While I appreciate that yes, you can run cards like City of Brass , it seems like there is something fundamentally wrong about not being able to run basic land cards to cast the spells you want to. For a long time this was a defining point of colourless decks, that they ran zero basic land cards. But since the release of Wastes (Which I'm willing to bet was partly to fill this gap in commander - though I'm sure somebody will correct me on this if I'm wrong), this hasn't been an issue. I think that while it's a harmless enough suggestion for your playgroup, it just makes too many problems if implemented on a grand scale. As I said, I think that abilities shouldn't modify the fundamentals of the game in the way you're wanting them too. And having caveats like that on rules is just going to complicate things. April 9, 2019 2:31 a.m.
April 8, 2019 11:36 p.m. So then how would you produce the mana to cast them? At the end of he day, devoid is an ability, not a card property an shouldn't overwrite such a core design of the game. Not to mention with the mana production issue, it just seems like a huge headache. April 8, 2019 10:29 p.m.
April 8, 2019 8:32 p.m. Which I am trying to optimise for cEDH play. There are a few cards in question and it would be good to get people's thoughts on it, if they have the time/energy. Cheers. April 8, 2019 12:38 a.m. I know Perplex gives you transmute for FC, however what are your thoughts on the new Dovin's Veto as a better, albeit harder costed Negate ? April 6, 2019 12:16 a.m.
April 4, 2019 4:40 a.m.
April 3, 2019 6:13 a.m.
April 2, 2019 11:07 p.m.
IAmTheWraith: That's true, I forget that there are other bits of text on the eldrazi. I would say that the only one you would want is Kozilek, Butcher of Truth for more card draw though. I don't think the rest of them add enough value personally, not for the mana cost at least. Kozilek has the benefit of card advantage, which works well in the deck. April 2, 2019 9:19 p.m. I like cards like Expedite and Crimson Wisps . The haste is nice and they cantrip as well. I kind of feel like you should have some big X spell to sink the mana into though, like a Comet Storm or something to flashback. Conjurer's Bauble is a good way to put key cards back into your deck, and Elixir of Immortality is a nice reset button (personally I think it would be better than an eldrazi titan, sorry IAmTheWraith). April 2, 2019 6:57 p.m.
SynergyBuild: I think that Cyclonic Rift works well against both of the aforementioned decks, as well as giving me flexibility against others as well. And just because there might be a better card against those two decks does not mean it will be as good against the rest of my play group. But this is what I'm trying to get at - now we're down to brass tacks here. We are talking about meta selections for very specific and minute optimisations (which may or may not help) and are straying away from the original topic. A topic which you have agreed with my counter-argument on, might I add (unless I am mistaken). So looking back at macro for a second, my overarching point is that we (both yourself and myself) have undermined the premise of this thread. I am happy to have a discussion around cards which might be better suited to my deck and to my meta to help squeeze that last little bit of value out, however that is a completely different discussion. That being said, one little niche case is not enough to make the statement "Why Cyclonic Rift is not as good as it appears" in my and I'm assuming many other players' minds, since for the most part it has been shown to be as good as most people think it is. Now, back to your statement around other options, I would be interested to hear your thoughts on potential replacements. April 1, 2019 6:22 p.m.
First, let's talk casual. I know you've mentioned that it's good - we are in agreement there and I'm not questioning whether or not you see the value. My biggest point here though is that as per the title of the thread is "Why Cyclonic Rift is not as good as it appears", which is what I (and I think many others) are disagreeing with. If the title of the thread was "Why Cyclonic Rift isn't always the best choice" then I think there would be a lot more people agreeing with you, however you wouldn't get the shock value you're going for. So touching on the topic of price for a minute. Under the original context of the thread, price is irrelevant in my opinion. Price should never affect the assessment of the playability of a card. Obtainability, yes, but playability, never. So in this context, budget alternatives are nice but all that should be compared is the text on the card, not the price below it. Now moving onto said card text. Ignoring the fact that most of the alternatives you listed are there because of budget, one major thing that stands out is most of the options listed are sorceries. While yes, you can float a bunch of mana before bouncing things, you often times will run into the issue where you still won't be mana positive in this situation (since there is a higher emphasis on land ramp/ next to no emphasis on ramp at all depending on who you talk to). So in this situation, often times you can't replay as many things as you would be able to if somebody else had cast the spell. Talking politically, this is where some of the other spells have some benefit. Normally when somebody rifts, there will not be a positive reaction from the rest of the table, due to the fact that a) it's a board wipe of sorts and b) it's asymmetrical. At least with most of the other board wipes, they affect you as much as the other players, so it's generally a defensive move only. In a casual setting, this is probably the biggest selling point for running other spells over rift, however I do not think that it reduces the playability of the card. Secondly, lets move onto competitive play. I agree that in competitive environments, not only are deck slots super valuable but there is much more of a focus on single point, cheap to cost removal (I know you didn't say this directly, but it stands out from some counter-card choices you listed. And we both know this to be the case). In this situation I think it comes down to the build of the deck and the meta you play in. Because in competitive circles, every card slot should be assessed for deck optimisation. A solid example of this is my Paradox Scepter Thrasios list. In it, I happily run Rift for a few reasons. The first is that my meta is quite creature heavy and while I also run deluge, having more than one board wipe is worthwhile. On top of that, it gives me single target bounce to get through stax, or mass bounce to get through more stax. It helps against Sisay and Najeela (both in my meta). And since I use a lot of dorks, having an asymmetric wipe is super useful. I get that not every deck wants to run it though. As mentioned, Kess decks would much prefer the flexibility of multiple card draws from roil, or the pseudo card advantage of rebuke. But at the end of the day, it doesn't make rift worse, just because some decks don't want to run it. And that's the kicker of it all. You can make the card look worse by looking at the decks it's not strongest in. But stretching the statement "Cyclonic Rift is good but might not be the best fit in your deck" into "Cyclonic Rift is overrated and too many people play it" is just that, a bit of a stretch. Again, there are good replacements for it. But these also don't make it worse as most of these replacements are either due to specific streamlining of a deck, your meta or your budget. April 1, 2019 1:22 a.m.
March 31, 2019 12:04 a.m. The only issue with this is that while it is "infinite" turns, what this more accurately means is five life per card in your library. So unless you have a way to constantly re-shuffle, at some point you run out of cards. I'm not saying it's hard to do, but Vela the Night-Clad , Palinchron and Deadeye Navigator seems like just an easy to combo loop with the benefit of actually being "infinite" by itself. March 30, 2019 11:26 p.m. This isn't the first one of these you've written. My thoughts are that if you want to write some articles (which is what these should be IMO) then it's worth talking to the right people and actually making them articles. It makes them more manageable as well as means that the forums aren't so clogged up with them. Don't get me wrong, I think having the discussion is fantastic and I can get behind them, however it would be talking to YeaGo about this (I'm not sure who manages the articles anymore) to do it properly. You're writing these in in a bit of a controversial style. I have no problem with this per se, however I can see the comment section turning pretty toxic if not managed correctly. Please keep this in mind with responses (everybody) and ensure that people are treated with respect. I'm not entirely sold on the argument here. I'll brush past the 75% mark here as we are in agreement. But in lower tiered decks, rift does just as much work as in 75% lists. This is because most decks don't have as refined ramp (i.e. they are slower) and interaction is much more scarce. So plays like rift are even more game changing against players who don't expect to see removal, giving the caster a huge board state advantage. I get that the card is ~$20 but the article isn't "Budget alternatives to Cyclonic Rift ". Not to mention we have all seen quite expensive decks that are just hot garbage. In the competitive environment is where the card is probably weakest. But even then, as mentioned is a 2 mana bounce spell at worst. And while there are some infinite combos that are purely spell based, most of them require permanents to actually loop. When most decks are trying to win with tight mana (either to keep countermagic open or to help pay for cards like Spell Pierce ), bouncing a combo piece can often buy you a turn, which will either give other players prep time to deal with the combo, or give you time to combo out yourself (this happens a decent amount). And in sweeper mode, it can help deal with decks like Najeela, who has become very popular recently, or help Najeela decks close out games, or help undo stax effects, or just slow down a game which is getting out of hand. Especially when timed well and paired with a Tymna the Weaver , it can help net you a few cards in hand. No, it doesn't get played as a sweeper as much in cEDH, but at 2 mana it is identical to Into the Roil . And sure, some decks are optimising for speed and card advantage as much as possible, but the most of those decks are lighter on removal because they are pushing for the turn 2 combo. It's like saying that Lotus Petal is good/trash. It's amazing in the right setting but not always going to be an auto-include. On the whole, I wouldn't say it's the most busted card in all of EDH, but the title of the article is insinuating (in my mind at least) that it's only ok while everybody always overhypes it. And this I disagree with. I think it's a strong card which is not out of place, no matter what level of EDH you're playing. March 30, 2019 9:39 p.m.